Polish clean with a soft cloth. Great sentimental gift for everyday use, however depending on the sand you choose the color may be dark and will not match the picture. I would still say it is a unique personal gift to give. I bought this for my wife. I would like to buy more since we frequent Sandals. If I was positive she could keep them seperate in individual boxes I will buy more. Antigua is next. I actually bought two, one for my daughter and one for my daughter-in-law. My daughter is a Navy pilot in Hawaii, and my daughter-in-law is a Navy wife, who was stationed in Hawaii with my son for 9.5 years. I gathered sand from Lanikai Beach, one of their favorites, so I hope they will cherish them as keepsakes from a time when they were living in the same place and from a place they loved on the islands! It was a birthday gift for a friend who loves the beach. This was a custom made item, filled with sand from a beach of your choice. The shape of the heart is better looking in person and has a really nice shape. It's not just a simple heart shape. I thought the heart was like a glass case that was filled but it looks like the sand is placed in the heart and covered with something clear. Looks great! Something unique that she'll love. This was THE MOST perfect gift for my sister. We spent all of our summers at this NJ beach at our summer home which we recently had to sell after our mother's death. This heart shaped necklace that contains actual sand from this beach could not be a more perfect symbol of our wonderful times of our childhood summers with our parents. It is so clever and unique and a perfect gift for so many occasions. It is well made and a perfect size. My sister loved it. The sand in the heart is perfect! We purchased Destin, FL sand and have collected sand from the beach for Christmas ornaments and other crafts in the past. The sand is sugar white, but has flecks of black and seashell gray. 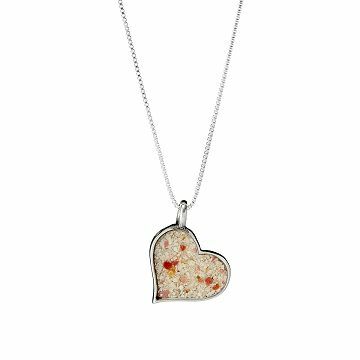 The sand in the heart necklace is a perfect match.